Not all medications are compatible with breastfeeding. 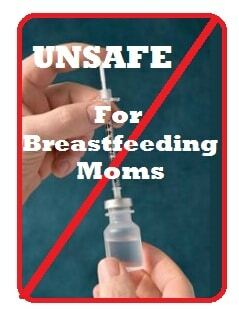 There are several unsafe drugs and medications when breastfeeding. It is possible that some of these drugs can be still be taken by a nursing mother if she stops breastfeeding for a few days or weeks. If you decide to do this, you will need to pump your milk and dump it during this time to keep up your milk supply. Your baby will stay healthy and fed by drinking previously frozen milk or formula. —Gallium-67: 1 week to 1 month depending on the dosage. Ask your doctor. **Bromocriptine (Parlodel): A drug for Parkinson’s disease, it also decreases a woman’s milk supply. **Most Chemotherapy Drugs for Cancer: Since they kill cells in the mother’s body, they may harm the baby as well. **Ergotamine (for migraine headaches): Causes vomiting, diarrhea, convulsions in infants. **Lithium (for manic-depressive illness): Excreted in human milk. **Methotrexate (for arthritis): Can suppress the baby’s immune system. **Tobacco Smoke: Nursing mothers should avoid smoking. Nicotine can cause vomiting, diarrhea and restlessness for the baby, as well as decreased milk production mommy. Maternal smoking or passive smoke may increase the risk of sudden infant death syndrome (SIDS) and may increase respiratory and ear infections. Keep your baby away from any second hand smoke as well! Why risk it? —Use medications only when necessary. —Learn ways to reduce the amount of alcohol or drugs in your breastmilk. —Be flexible; ask your doctor to choose medications that are preferred for breastfeeding mothers. —Try to completely avoid unsafe drugs and medications when Breastfeeding. Want to read some great Breastfeeding Stories from our visitors or Submit Your Own Breastfeeding Story?